Fly swiftly on the wings of angels, old friend. Crack open an ice cold Old English and pour it directly onto the street. The MMORTS Battleforge is going offline permanently October 31st of this year. It's always a bummer every time an MMO closes its doors for good. No matter how many people still play in the end, there is an excellent chance that folks made allies and built friendships in game. Not to mention spending countless hours grinding for greater rewards that they will never see again. EA is offering one condolence to the remaining Skylords of Nyn. All the cards in Battleforge are available for free until the servers are shut off for good. While the game is being terminated at the end of the month, the forums will be open until the end of November in order to give folks a chance establish new methods of contact with friends they met through the game. 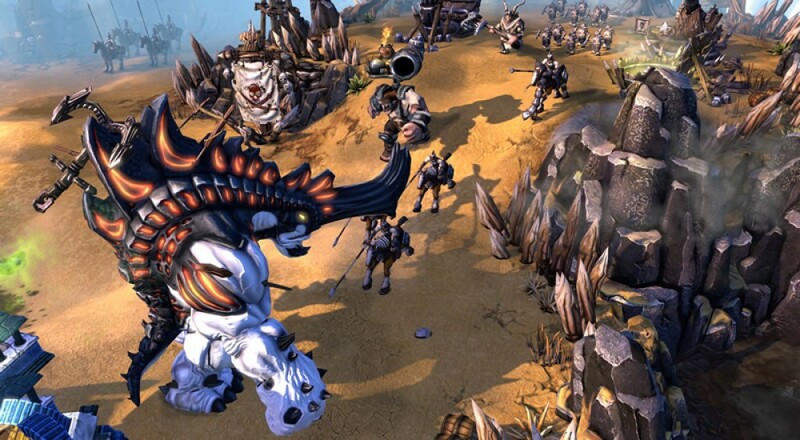 Battleforge plays like Magic the Gathering mixed with Command and Conquer. Skylords (those are the players, by the way) place cards onto the battlefield which turn into units. Then it becomes the classic RTS standard of "run all my guys into those other guys and hope my guys don't die." Check out some gameplay below. The look of the game is fairly unique. I can think of only a few experiences which allow you to charge a rhino-demon thing into a robot shaped like an Aztec temple, which is always a win in my book. Too bad that opportunity (just as so many like it!) will close its doors at the end of October. Fare the well, Battleforge. We hardly knew ye.